Egypt's government-appointed press council has condemned what it described as a blockade imposed by police on the Journalists Syndicate building in Cairo, declaring full solidarity with the union after it was raided by security forces earlier this week. The High Press Council called on authorities to "immediately end this siege…and act in a responsible, appropriate manner." 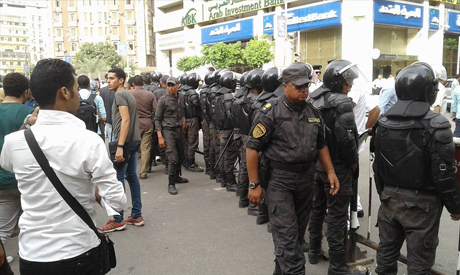 Security forces have for days closed off a road leading to the syndicate, banning youth, political figures and members of professional syndicates to access the building to show solidarity with an ongoing sit-in by journalists against Sunday's police raid. Security forces have only been allowing syndicate members to enter the building in downtown Cairo. The council, which is in charge of overseeing media regulations, expressed in a statement on Tuesday its "full solidarity with the press syndicate in its defence of freedom, the profession's dignity and the rights of journalists." It added that the crisis is mainly about “general freedoms, and at the core is press freedom, the role of journalists, and the independence and respect of [their] syndicate." The council also criticised a media gag order announced by Egypt's top prosecutor on the case Tuesday, saying the country's constitution guarantees freedom of press, opinion and expression as well as "the right to exchange information." Two journalists were arrested during the unprecedented police raid on Sunday, which the interior ministry has denied that it undertook. The ministry said it followed all legal measures to arrest both men, who are currently detained pending investigations. Syndicate officials have said it was the first time police have raided the building since the union's founding 75 years ago.